Lulupu - The Craft Lounge: Thank you!! I hope you guys join us for the first challenge up at lulupu.. It is a stamping challenge and a prize up for grabs is a MICIA medium sized stamp set.. So what are you guys waiting for.. Go and get out your stamps and join us.. The more the merrier.. :-).. For details check here. This is so cute! Your stamping is so good... Love the flower and the coloring... I like this fold.. really adorable.. Such a cutie! Loved the big bloom! 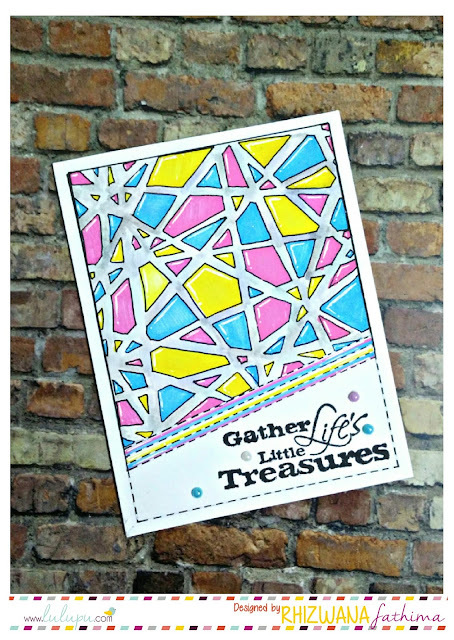 Sure an inspiration to try some stamping! very pretty colours and nice stamping !! Lovely card Khushboo, love the stamped BG with the bling. I don't understand your phobia...when you are so good.perfect and neat stamping and lovely coloring.Well done.